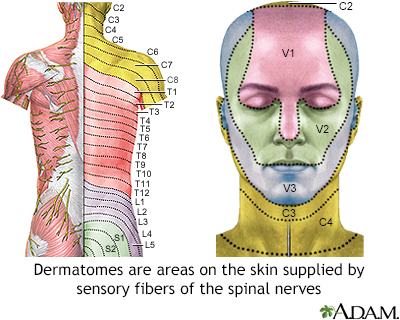 Understanding the nerve distribution along the dermatomes is helpful in determining how certain diseases, such as shingles and some other neurological conditions, target one area of the body. The letter-number combinations show the relationship between each area and its corresponding sensory nerve. The vertebrae are classified as C for cervical, T for thoracic, L for lumbar, and S for sacral. The trigeminal nerve is the fifth cranial nerve, represented by V.